Major League Baseball is taking a bottom-up approach to increasing diversity in the front offices of its 30 clubs. The Fostering Inclusion through Education and Leadership Development (FIELD) program was launched in August 2016 by two Minor League Baseball (MiLB) officials to introduce underrepresented groups to professional baseball. League President Pat O’Conner and Vincent Pierson, who heads diversity and inclusion, had informal conversations in late 2015 about increasing the number of people of color and women within the league and its 160 clubs. This, in theory, would eventually lead to an increase in diversity among those in the stands and watching on television. “We’ve always wanted to find ways to drive more awareness into the groups of women and minorities that are underrepresented within our ranks,” Pierson, 27, said. O’Conner, who has worked in professional baseball for more than 30 years, realizes the only way to keep Minor League Baseball — and, by proxy, MLB — financially afloat is to reach out and embrace underserved factions of its audience. In 2009 he created the organization’s diversity initiative, which is composed of a five-point initiative that emphasizes developing strategies and partnerships that influence diversity at the ownership, executive, management, fan base and business-to-business levels of the league. To create what the league refers to as the “next generation of diverse leaders in sports business,” FIELD offers its participants access to a vast network of sports professionals, from the commissioner’s office to individual minor league clubs. During the program’s five-day symposium, selected participants are flown down to the MiLB headquarters in St. Petersburg, Florida, where each day is broken down by a different industry department. The first two days consist of introductions to baseball, complete with a field trip to a clubhouse, where the students shadow operations and promotional staff, receiving a behind-the-scenes look at how professional teams are run. They then work with their assigned mentors, a collection of league support staff, on professional development skills such as mock interviews and job offers in preparation for the annual job fair at the baseball winter meetings. During the remaining two days, the participants are assigned to create game promotions centered on inclusion for various minor league teams. For example, a group from last year developed a cricket-focused promotion for the Durham Bulls franchise, which targeted North Carolina’s burgeoning Asian Indian population. 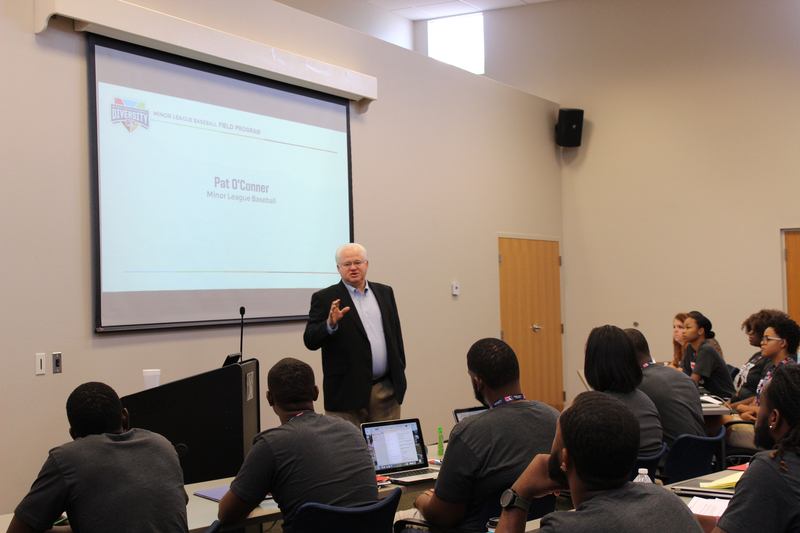 President of Minor League Baseball Pat O’Conner speaks to the FIELD class. For the inaugural class last year, FIELD worked with directors and professors from seven partnering universities — including Florida A&M, Virginia State and Hampton — to identify 25 qualified candidates based on educational performance and interest in sports management. Two of those candidates, Jessica Nori and Ryan Winters, successfully completed the FIELD program in August 2016. They attended the winter meetings in National Harbor, Maryland, in December 2016 and accepted positions within MiLB soon after. In January, Nori, 26, accepted a marketing internship at MiLB headquarters, where she’s responsible for developing partnerships among minor league clubs. She is a recent graduate of Florida State University and received an MBA from the University of Central Florida. She’s a longtime baseball and softball fan, lettering in the latter at Florida State, and has always wanted to work in sports. “For me, the FIELD program a) opened my eyes to what Minor League Baseball has to offer and b) showed me that, OK, so there is a way for me to get into sports and still get my feet wet in a few different areas,” Nori said. Winters, 23, secured a stadium operations internship with a minor league club in Iowa, the Quad Cities River Bandits. He graduated from historically black Hampton University in 2016 with a bachelor’s degree in sports management. He played baseball up to college and has known since his sophomore year of high school that he wanted a career in sports. Growing up in Tustin, California, which is an hour south of Los Angeles, Winters wasn’t exposed to many other African-Americans, and attending Hampton and the FIELD program has provided him the foundation he will need in a homogeneous industry like baseball. People of color are underrepresented when it comes to front-office positions in three of the major sports league in America: the NFL, NBA and MLB. People of color make up nearly 39 percent of the U.S. population (women account for better than 50 percent), yet people of color do not make up even 6 percent of team presidents in any of those professional leagues, according to the University of Central Florida’s Institute for Diversity and Ethics in Sport. MLB mostly trails the NBA and NFL when it comes to diverse hiring among team presidents, vice presidents, general managers, and senior and professional administration. The WNBA, one of the least popular professional sports leagues in America, is at the forefront of racial and gender representation in league front offices. While MiLB’s hiring numbers are confidential, Pierson estimates that the league’s diversity is right on par with MLB’s. Of the 160 clubs at the minor league level, there are 12 women and/or people of color among presidents, vice presidents and general managers. While FIELD is a few years away from being the premier sports development program for people of color, by all accounts the program was a success after its first year. Of the 23 students who attended winter meetings in December 2016 (two elected not to attend), seven accepted a position with MiLB or MLB. Another student works for the NBA’s Philadelphia 76ers, and others either accepted jobs in collegiate athletic departments or returned to a university to finish a degree. Five years from now, Pierson said, a former FIELD participant could return to St. Petersburg as a high-ranking baseball official to speak to a new crop of attendees. The dream may not be too far off. Nori — who identifies as Spanish, Italian, Filipino and Portuguese — and Winter both aspire to be MLB general managers someday.